Milan Fashion week always makes me nostalgic. So this year, I am sharing my favorite spots and things to do in the city. 1. 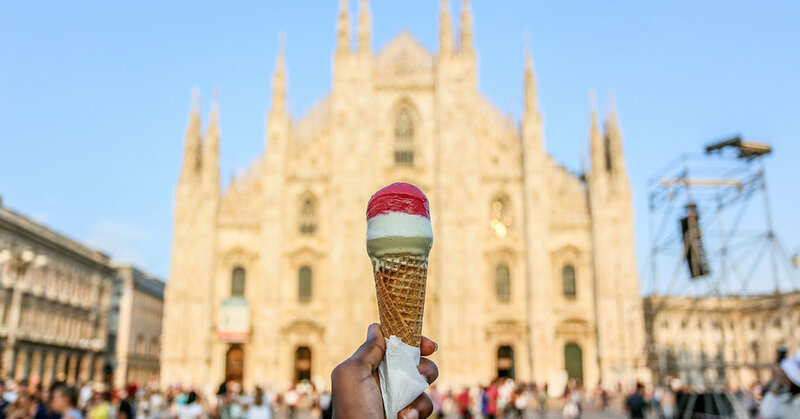 Grom Gelatria –Picking a favorite Gelato spot is a very hard thing to do in Italy. Nonetheless, I am convinced nothing beats the pistachio gelato at Grom. 2. Pizza AM – If you are in the mood for a good Neapolitan pizza that is reasonably priced, this is the place for you! The place is relatively small and is popular amongst locals and tourists so there will probably be a line, however the restaurant offers a specialty pizza sampler and a glass of Prosecco, so it’ll be worth the wait. 3. Duomo- Located in the heart of the city, the cathedral church of Milan is a must-see for every visitor. There is an option to climb a few hundred steps within a narrow staircase or take an elevator to enjoy a closer look at the statues that decorate the cathedral. You can also get a great city view of Milano from the top. I would also suggest dinning at near by restaurants such as Terrazza Aperol, Zucca, Obicà – Duomo, or Gran Caffe Visconteo for a great view of the cathedral. 4. Teatro alla Scala – This is the leading Italian opera house and one of the principal opera houses in the world. When I was studying in Milano, my friend had found tickets to a performance so I was able to attend and it was nothing short of spectacular. So, I highly recommend you go. a.k.a mini-sized tastes of heaven offered at Luini. I am all about exploring the most unusual options but you can’t go wrong with the tomato and mozzarella option here. 6. Via Montenapoleone- This is the most famous upscale shopping street in Milano, known for its ready-to-wear jewelry and fashion shops. It is definitely worth taking a stroll through to window shop or to make a timeless designer purchase. 7. Santa Maria delle Grazie- Most people seek out this church to see Leonardo da Vinci’s, The Last Supper. Milan’s famous mural is hidden in the refectory connected to the Dominican convent. You must book tickets way in advance since it’s very rare to find tickets by just doing a walk up. A few places you can look into to buy tickets are, tickitaly, viator, milan-museum, lastsuppertickets.